When we ordered our aluminum Camplite camper we went on the search for aluminum products to outfit the trailer. One of my first Google searches was for an aluminum coffee maker. 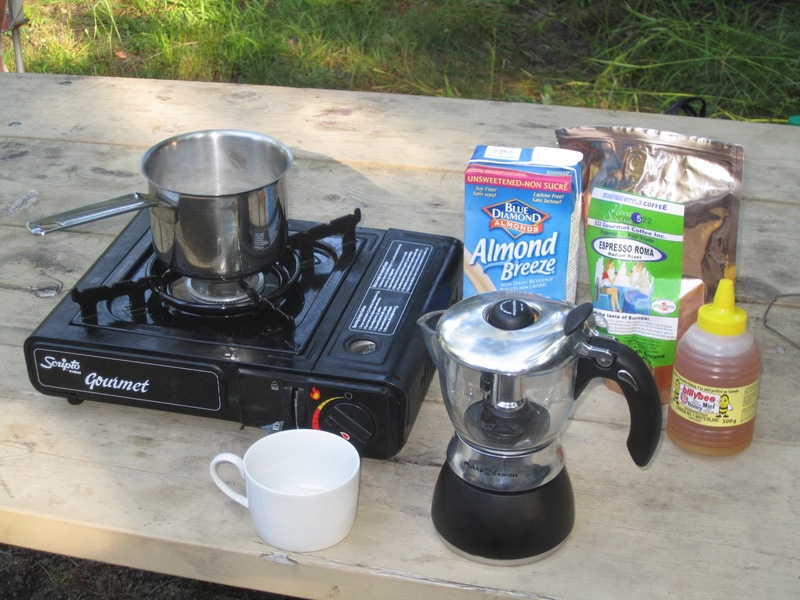 It seemed obvious to me that an aluminum trailer needs an aluminium coffee maker. Of course it does. In my work week I drink a lot of coffee - too much I know. For weekend camping trips I knew I'd be needing caffeine fixes if I am to keep the withdrawal headaches and associated evil crankiness at bay. 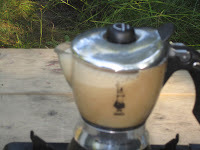 I soon learned from my Googling that most Italian families have small stove-top espresso or cappuccino makers at home for their daily use. Typically they are made from cast aluminum or stainless steel. Aluminum + cappuccino... Now that's the ticket! I ended up ordering a Bialetti "Mukka Express Vitro" from an online chef's store based in Toronto called Consiglio's Kitchenware & Gift. They had the best price I could find + free shipping! The service was excellent with my order shipped within a couple of hours of ordering it. Consiglio's sell many brands of Italian coffee makers including Bialetti, who is a major manufacturer of such equipment. The stove-top units aren't made to compete with big expensive commercial espresso makers that need a skilled Batista to operate. Instead they are designed to allow us ordinary folks to make a decent cup of a real coffee product at home (or at a campground). It is my understanding that the average Italian home has equipment along this line and never a Mr.Coffee. The Mukka Express I bought is designed to make a "mukka-cappuccino" which is basically espresso injected into milk at a rate of about 50/50 and where steam is used to froth up the milk. The patented design does this all automatically on a stove top after loading it up with the correct amounts of water, espresso coffee grounds and milk. The design features a aluminum bottom vessel that you partially fill with a specific amount of water. Into the top of that vessel you drop in place a fitted stainless steel funnel with a spring-loaded screen. It forms a little basket to receive the finely ground espresso coffee. You need a flavorful espresso or other dark roast for it to make a tasty mukka-cappuccino. Using regular coffee grounds results in more of a mukka-mukka with hardly any discernible coffee flavour. With the coffee grounds in the basket the glass top can be firmly screwed down onto the threaded top of the aluminum vessel. A big rubber gasket helps seal the two parts together. This is important because the bottom is a pressure vessel. When heated it builds up considerable pressure that results in the water getting much hotter than a regular boil. Ultimately the pressure pushes the super-heated water up through the ground coffee but we are getting ahead of ourselves. Before it goes on the burner the upper glass vessel needs a specific dose of milk. The model I have is a 'vitro' one which refers to the glass -- as vitro means glass in Italian. The glass allows you to see the process. Similar models without the heavy glass are made. They typically have a painted or polished metal upper vessel. I thought the glass was a nice design feature. In my unit I put some unsweetened vanilla-flavoured Almond Breeze "milk" that I had preheated and sweetened with honey. I find preheating the milk helps result in a hotter cup of coffee. Any milk can be used. We've tried 1% cows milk, soya milk, and even chocolate rice milk - all with good results. With the milk in the upper vessel, and water & ground coffee below, the setup is completed by snapping a special valve assembly (the patented part) into place in the glass vessel. 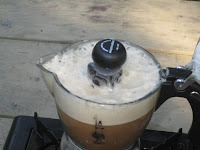 When the coffee maker is sufficiently heated, the valve will successively release the espresso & steam into the milk. It does so with a pop then a pleasing gurgling followed by a hiss and a squeal. The sounds are exciting! Heck even before those sounds it is exciting. Initially when the unit is put on the burner nothing much appears to happen and there are no sounds - yet this stage is exciting! If you graduated high school then you know what's happening is the water is heating and the pressure is building and building. Waiting for the sudden pop of the valve you don't know if the whole thing is going to explode. Given the pressures involved it probably could kill you or at least ruin your day by blasting you with steam & super-heated water. Such risks are always exciting! To lessen the risk the designer wimps included a safety pressure release valve that is intended to release excessive pressure long before the pressure vessel would ever explode. Alas, there is of course no way to test the release valve. Maybe it will work - or maybe not. Oh my it is exciting! Adrenalin pumps through you veins. Forget extreme sports - you can get your adrenalin fix by making coffee. When the special valve in the upper vessel does pop, seeing the successive release of espresso and steam is very exciting. Part of the excitement is not knowing if the whole thing is going to overflow the top vessel. It will certainly look like it is going to overflow and there is a deeply satisfying sense of relief when it doesn't. If it does overflow you can curse & swear at it to release some of your own pressure! The coffee drink it makes is pretty darn good. Preparing it at a campground makes it taste even better. 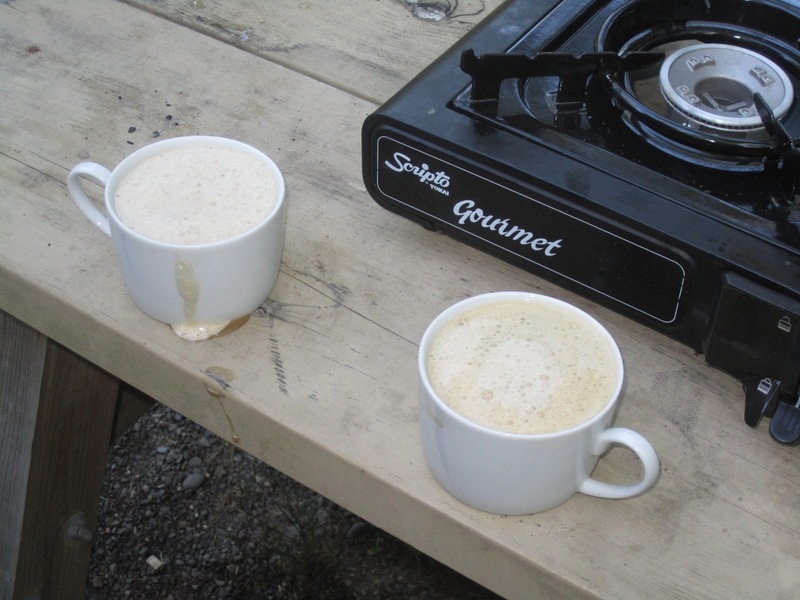 There is something especially pleasing about having a coffee as sophisticated as a mukka-cappuccino while roughing it camping. You can be a camping god or goddess even though you smell like a campfire and have messy hair. The only downside of taking this little miracle machine camping is having to properly clean it. The design has little nooks and crevices where bacteria could grow if you don't clean it thoroughly. If you are trying to conserve water then the amount it takes to clean it up properly may bother you. Overall I think it is a great addition to our camping equipment. The simple pleasure of having a fancy cup of coffee is a great addition to the camping experience. I highly recommend it. I mostly drink tea these days because I got dissatisfied with plain coffee. 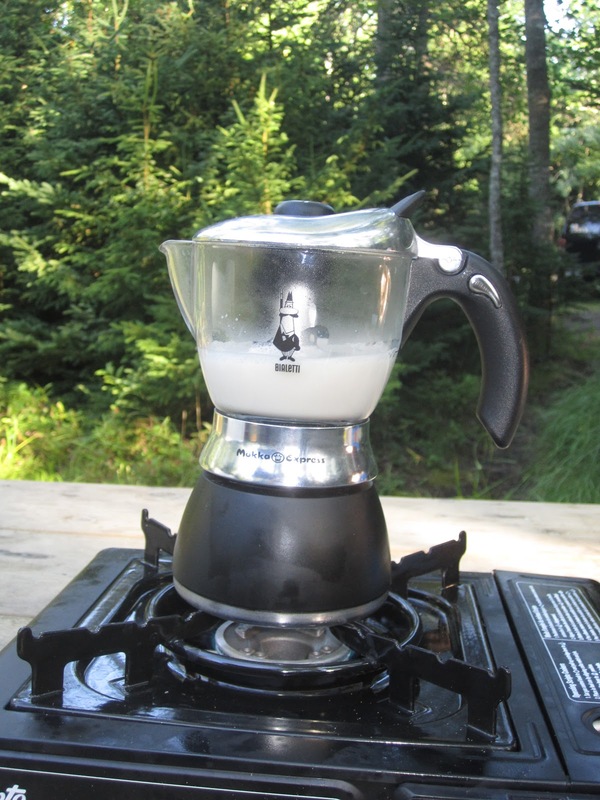 Several years ago I bought an expensive cappuccino maker , but was never really satisfied with either the taste or temperature, and I sure wouldn't want to haul it around when I go camping. This sounds just like what the Dr. ordered, both for camping and at home. Here's a tip before you buy one of the smaller espresso or cappuccino makers. If you see a model you like do a Google search on it. Chances are it has been discussed at length in some of the coffee related forums. (Those folks get pumped up on caffeine and spend their sleepless nights posting on coffee forums). For instance I read dozens of reviews before ordering the Mukka Express. From those I learned many people had problems getting everything to work right. I concluded most who complained were failing to follow the instructions. With mine it works every time - provided I follow the instructions. The primary difference in my technique is to ensure the coffee is suitably hot, I pre-warm the milk. Coffee machine is actually designed to be a professional java machine, a personal one. I have invested The Best Coffee Maker Review many years in the coffee industry and I have worked with well-made professional quality equipment. I usually expect more out of my home equipment because of my experience. I'm a 57 year old retired architect who lives a quiet, peaceful, life in beautiful Prince Edward Island, Canada. (I like to call PEI the land of lawn tractors). I live with my bride of 31 years, our two sons, and a cute Westie named Dixie. © Ross Macintosh 2012. Awesome Inc. theme. Powered by Blogger.